If you have ever played sports or know anything about sports, you know that practice makes perfect. This is why it can be a bit of a challenge with golf. Golf is an outdoor sport, and it is generally only played when the weather is nice. It really cannot be played outside when the weather is cold and there is snow on the ground. 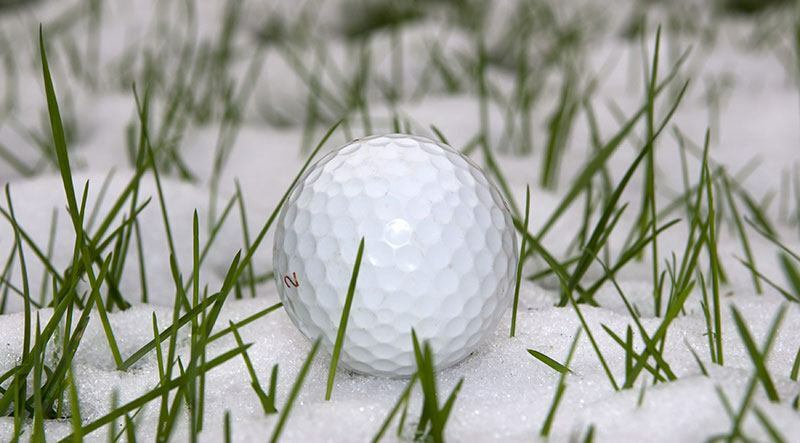 However, there are plenty of things that people can do to get better at golf in the winter. 1. Practice whenever you can. Even if you cannot practice on an actual golf course, you can replicate the environment someone even in your own home. You can even create a synthetic mat that has an actual hole for the ball to go in. 2. Play golf using a simulator. This may not be the exact same as actually playing on a golf course, but it will be better than nothing for sure. It can keep your competitive spirit alive because you are still trying to get a certain score. Additionally, you can virtually put yourself into a location where you are actually playing the game, and you can improve your game this way. 3. Make 100 golf swings on a daily basis. Well known golf instructor, Hank Haney comma has given the advice that during the off-season, a player should still be making at least 100 golf swings every day. He also has stated that the best way to groove a swing is to repeat it over and over without necessarily focusing on where the ball would be going. This means that you can do this with just a golf club and no ball. You can do this in your backyard or even in your house, as long as you have high ceilings. 4. Do the appropriate workouts to strengthen your golf playing muscles. Many fitness experts will tell you all about the importance of building up your core strength. This will be great for you in many aspects of life, not just your golf swing. However, in the wintertime, even if you can’t actually play golf, you can do different exercises that will strengthen the muscles that you will be using to play golf in the next season. In fact, you can make it even more effective by allowing yourself to become inspired by images of you playing golf with power while strengthening these specific muscles. 5. Test out whatever new equipment you can find. There are many ways in which you can benefit from this. If your equipment happens to be outdated or your swing has changed, it would help to look at new equipment. You can also test this equipment on a launch monitor to make sure that it is a good fit for you. This will help you be more prepared for being at the top of your game when the season does start. 6. Read more about the game. If you read books and manuals that are full of tips on the game and secrets used by the pros, it is not the same as practicing them yourself, but it can give you a lot of knowledge that can help you when you are able to practice. If you love golf, you will enjoy reading about it and finding new potential ways to improve your game. As such, it makes sense to do as much reading as possible, so that you can absorb as much knowledge as possible and have multiple different tips that you can apply to your practice when you are finally able to get to it. You can even practice these tips indoors to the extent that you can in the winter. 7. Go bowling. Bowling has actually been referred to as the “wintertime golf methadone.” It will keep your competitive spirit alive, and it will allow you fun time with your friends while playing a game that actually does require quite a bit of skill. Just like golf, bowling requires precision and just the right amount of strength. You will even be exercising some of the same muscles when you are going bowling that you will be using during your golf game later. 8. Play actual golf when you have the chance. They are not going to keep cutting actual holes into the grass, but they generally do not build barricades around golf courses. If there is no snow on the ground, you can generally still get in some reasonable golf practice. In any weather that is more than 35 degrees Fahrenheit, it is actually recommended that you take the opportunity to practice as much as possible. Just wear layered clothing and expect that it is going to be somewhat different compared to how it is during the season.